Ann Jemima Allebach (8 May 1874-27 April 1918), has the distinction of being the first Mennonite woman on record to be ordained a minister by Mennonites in North America. 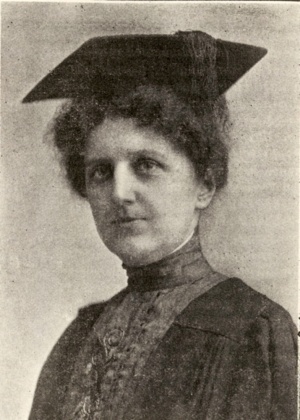 She was ordained 15 January 1911, at First Mennonite Church, Philadelphia, by minister N. B. Grubb, assisted by her pastor, J. W. Schantz, of Eden Mennonite Church, Schwenksville, Pennsylvania. Ann was born to Jacob R. and Sarah Markley Allebach of Green Lane, Pennsylvania. Her parents were successful merchants, and her father, in addition, became the banker and postmaster of the town. She was baptized in the Eden congregation and became active in the Christian Endeavor movement, founding the first group in her area. In 1893 she became principal of the East Orange, New Jersey, Collegiate School and attended classes at New York University, Columbia University, and Union Theological Seminary in New York City. During these years in New York, she was engaged in the women's suffrage movement and served among the poor, teaching Sunday school in an Episcopal chapel and interviewing job applicants. At one point, at the request of the New York mayor, she arranged conferences on home religion and other social services. It was during these years that she approached her mentor, N. B. Grubb, pastor of the First Mennonite Church in Philadelphia, and her own pastor, about ordination. It appears that they, more or less on their own, were open to her convictions and proceeded with the service in the company of a large audience of church members, friends, and family. Even though it may have been done at that time with little conference support, there did develop some openness in the conference to have her return as guest preacher from time to time. Her Christian commitment and fervent oratory drew large and curious audiences. One September Sunday in 1912 she preached in the morning on Job 23:8, 9 at her home congregation at Eden; in the afternoon at Zion congregation in Souderton on John 14:6; and in the evening at Harleysville Chapel on Acts 1:8, all to overflow audiences. From 1911 to 1918, her name appeared on the annual roster of Eastern District Conference ministers in Mennonite Yearbook and Almanac. In 1916 she accepted a call to ministry at the Sunnyside Reformed Church, Long Island. Here, as elsewhere, people were drawn by her enthusiasm and earnestness, until a sudden heart attack ended her short, but intense life. "Biography." Mennonite Yearbook and Almanac (1919). "Sketch of Miss Annie J. Allebach." Mennonite (19 January 1911). Cummings, Mary Lou.Full Circle. Newton, KS : Faith and Life Press, 1978. Ruth, John L. Maintaining the Right Fellowship. Scottdale, PA : Herald Press, 1984. Fretz, J. Herbert. "Allebach, Ann Jemima (1874-1918)." Global Anabaptist Mennonite Encyclopedia Online. 1990. Web. 19 Apr 2019. http://gameo.org/index.php?title=Allebach,_Ann_Jemima_(1874-1918)&oldid=132569. Fretz, J. Herbert. (1990). Allebach, Ann Jemima (1874-1918). Global Anabaptist Mennonite Encyclopedia Online. Retrieved 19 April 2019, from http://gameo.org/index.php?title=Allebach,_Ann_Jemima_(1874-1918)&oldid=132569.